Step 1: Open YouTube in your browser. Login to your YouTube account. Step 2: In the top right corner you will see your photo. Click on the photo. Step 3: In the drop down you will find an option Dark Theme. Click on it. Step 4: You should be able to see a Toggle now marked "Active Dark Theme". Active the toggle and change is applied. This setting will work only on the browser you are using. 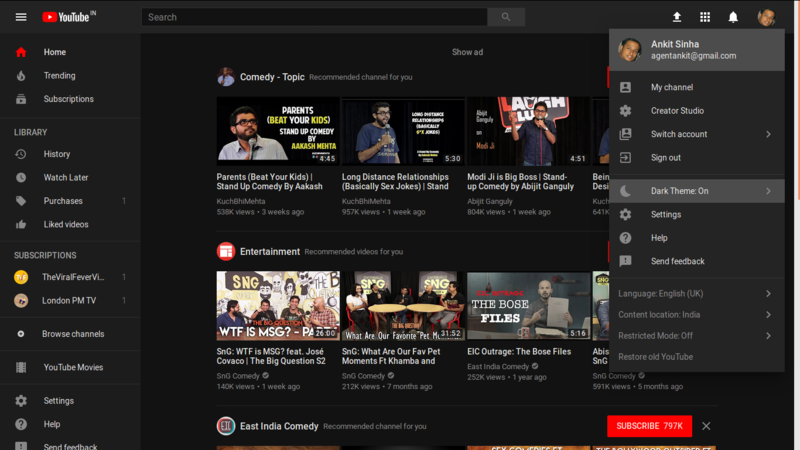 So for example, if you use both Google Chrome and Mozilla Firefox then even if you are signed in on the browsers with the same Google account and are using YouTube, the Dark Theme won't work unless you activate them individually on both. This is specifically mentioned in the box where your Drak Theme toggle is present. Also, this won't work in the same browser's incognito mode. These changes have been in the making since the month of May and were only available to the developers from quite some time. These were rolled out for normal users recently. There are a few more changes that came with this update, the logo is now a brighter red than before and the text looks bright in the default background and white if you turn on the Dark Theme. Other than these the rest of the changes were for the app layout. The navigation tab has been shifted to the bottom of the screen and Library and Accounts tab have been added to the layout. In terms of video playback now you also have the option to play the video in slow or fast motion. Up until now you could control the speed of the video only on desktop.